We know that supplier quality management includes ensuring that raw materials and supplies arrive on time and meet quality requirements. A great way to achieve business results, and exceed them, is to work with a supplier that understands the care that goes into your business. When you manage supplier quality management effectively, you can surpass your targeted business goals. Implement cloud-based integrated Information Technology (IT) Storage.With modern internet capabilities and mobility, effective communication can be easily integrated throughout your company. Data and other important information can be effortlessly stored, sorted, and accessed. Current capabilities also allow for efficient, convenient interactions across your supply chain. Information can also be synched so that those who access the same file are able to view the latest updated version of a document. Businesses realize how important these technological aspects can be to company performance, which has increased the need for secure, user-friendly IT architecture with large storage capabilities, and for IT experts. Determine the necessary criterion for supplier quality management evaluation. There are basic Key Perfomance Indicator (KPIs) and Key Result Areas (KRAs), such as lead time. Other criteria depend on the specific needs of your company and the agreement you have with your supplier. To review your company’s criteria, you can refer to the list of product requirements and supplier standards that you and your supplier signed at the beginning of the working relationship. This document may also include company values that you expect your vendor to observe and practice. You can also refer to industry regulations and certification protocols that your supplier should adhere to, as well as findings from previous audits. Acquire a Supplier Risk Scorecard System.This allows you to measure the risk a supplier may pose to your business and the manufacture of your product. When choosing a new supplier, you can use tools that allow you to compare suppliers. Using these tools allows decisions to be made without the risk of bias or accidentally overlooking any criteria that should be considered and other factors that could prevent a logical decision from being made. These tools will allow you to evaluate suppliers against each other so you can choose the one that best meets your needs. You can create your own tool, but investing in ready-to-use software will save time in research and development. Create a collaborative working relationship and conduct audits.There are no replacements for supplier quality audits, but audits are often viewed as a form of policing. Suppliers are often skeptical of the auditing process, as it allows the client to see a supplier’s internal weaknesses. Even if your company, not a third-party firm or organization, conducts the audit, your auditor may not be immediately welcomed at the facility. However, to be successful, both you and the supplier should view audits as a way to improve supply and the quality of the partnership. Your company should see this as an opportunity to get to know your supplier better and to provide constructive criticism. Suppliers should view this as an opportunity to gain a new perspective on their internal processes. A fresh pair of eyes would be more apt to identify gaps, ambiguities, and redundancies in systems, processes, and protocols. Have suppliers take more responsibility over the quality of their supplies.Depending on the type of supplies provided and the supplier’s business scope, suppliers can also have their own suppliers. Your supplier should understand the importance of being aware of the quality of raw materials they are provided with. This is similar to your responsibility for ensuring that the quality of the finished product is in sync with your consumers’ expectations. Partnering with a supplier that comprehends the scope of their responsibility should reduce chances that you are provided with unsatisfactory supplies. Supplier quality management is an area that can continuously be enhanced in every business model. A company with optimized operations is able to provide better products and services to their customers. 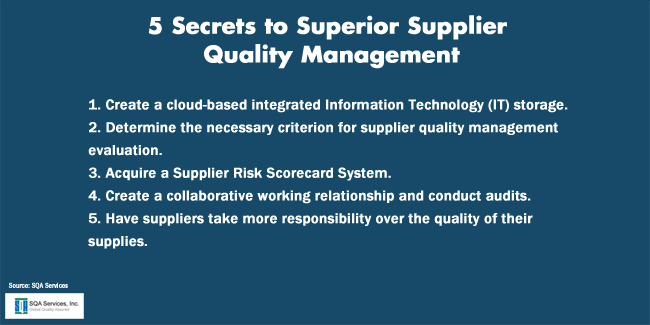 Superior management of supplier quality, as well as other aspects of business operations, allows the company more flexibility and a heightened ability to meet demands at lower costs within a shorter timeframe.